New Disney's animated film "Wreck-It Ralph" will officially be released on December 12 in Belgian cinemas. This doesn't prevent most national theaters to start screenings as soon as tomorrow. 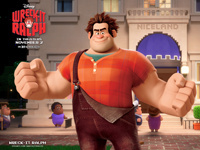 Directed by Rich Moore (Futurama, The Simpsons), the film tells the story of Wreck-It Ralph, the vilain from Fix-It Felix, Jr. arcade video game. Ralph is tired of being the bad guy and of being rejected. He leaves his job in Fix-It Felix, Jr. to find a mean to earn the respect of other video game characters. Felix tracks him down. Wreck-It Ralph will delight arcade game fans with many references and appearances of characters from the video games of our childhood. Disney has been through with the idea by building an authentic "Fix-It Felix, Jr." arcade cabinet and publishing advertisements for the arcade seen in the film showing fictional games appearing in the movie (such as Sugar Rush Speedway and Hero's Duty). 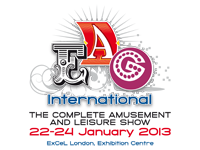 Hopefully Wreck-It Ralph will raise general public's interest for arcade video games. Sega shifts into 7th gear by releasing Initial D Arcade Stage 7 AA X today. 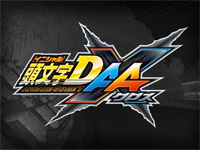 Shuichi Shigeno's manga is nearing its end, so it was time to produce a sequel to Initial D Arcade Stage 6 AA that updates the story mode with the latest events appeared in the manga. The story mode can now be played in teams of 2 and "Project Kanto's fastest" mode is now available in addition to the Tag Battle mode. This cooperative mode consits of 2 on 2 battles: Both races take place simultaneously, one uphill and the other downhill. The "ACE" emblems system is still present but scores are higher when both players catch an emblem of the same colour (gold or silver). 43 cars and 14 courses are featured (against 34 in Initial D 6). Tsuchizaka stage from Initial D 3 returns thanks to fan request. Players can still tune their cars and new accessories (clothing, hairstyles, ...) are available to customize avatars. The online mode is now open to the following countries: Taiwan, Hong Kong, Korea, Malaysia, Singapore and Macau. Like its predecessor, Initial D Arcade Stage 7 AA X runs on RingEdge. As usual, the opening theme, Cross the X, is composed by m.o.v.e. Another famous Japanese artist has also participated to the game OST: GACKT with the title Jounetsu No Inazuma. Titles form previous editions are back as Remember Me, Night of Fire and a remix of Gamble Rumble. 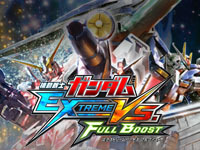 Namco Bandai releases Mobile Suit Gundam Extreme VS. Full Boost's latest update today. Ony one new mecha is added: It's operated by Mafty Navue Erin (Hathaway Noa) and coming from a series of three novels named Mobile Suit Gundam: Hathaway's Flash. Its costs 3000 pts and is equipped with Beam Saber, Funnel Missiles, Mega Beam Cannon, Missile Launcher, Sand Barrel, Beam Rifle, Shield and Missiles. Two new navis also appear: Elpeo Ple coming from Mobile Suit Gundam ZZ (anime aired between 1986 and 1987) and Soma Peries from Mobile Suit Gundam 00 (anime released between 2007 and 2009). 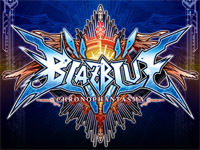 BlazBlue Chronophantasma is out today. This is the fourth episode of Arc System Works' 2D fighting game series and this is the first out on NESiCAxLive. Fans will be delighted to find again the characters of the series whose artwork and sprites were redrawn. New characters are introduced: Amane Nishiki, Bullet, Azrael and Izayoi (which will be available from December, 12). Two old characters will also return later: Nu-13 on November, 18 and Mu-12 on December, 5. The old characters have been re-balanced and new moves have been added to their movelist. New compositions will appear and old rearranged themes will be included. The stages will be entirely new ones except Rachel's stage. In terms of gameplay, the Gold Break Bursts and Guard Primers were removed. By cons, each character features now an Over-Drive: Over-Drive bar fills over time and when it is full, Over-Drive is activated for 5 seconds: character's strength is increased and he can perform new unique moves. Cruch Trigger replaces the Gold Break Burst, the Heat gauge is divided into 4 parts (2 previously) and to activate the Trigger cruch, the players has to use 1/4 of the gauge and press A+B to crush's opponent's guard. However, this does not work on the Barrier Guard. Konami's third REFLEC BEAT game will be released tomorrow. 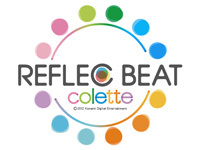 It is named REFLEC BEAT colette, collette is a combination of the words "collect" and "palette". The game theme is based on the seasons: cabinet's colors will change with the seasons (currently Winter). This is not the only change due to the season: the playlist changes according to the season! Some cross-over with other BEMANI titles are also planned: pop'n music in Winter, a general BEMANI event in Spring, beatmania IIDX in Summer and beatmania IIDX et en automne c'est avec jubeat in Autumn. Small changes to the gameplay have been done: the timing is tighter than in the previous game, the Chat symbol is expanded, a Clear Gauge Type B is added (an inverted version of the classical gauge that starts at 100% and decreases over the song), the customization interface is redesigned with new options,... The hidden songs from REFLEC BEAT limelight return. Upgrade kits will be available on November 28. November is synonymous of WCCF at Sega. This year celebrates the series 10th anniversary and sees thus the release of World Club Champion Football Intercontinental Clubs 2011-2012 ... A new total of 24 clubs including 5 new ones is proposed to cards' collectors: Manchester City FC, Bayer 04 Leverkusen, Olympiacos FC, FC Shakhtar Donetsk and FC Zenit Saint Petersburg. The cards are still divided into three levels of rarity: regular (white), special (black) and rare (metal). Among the rare cards, there are several categories: European Superstars, World Superstars Superstars U23, MVP, All Tile Legend and King of Legend. The game menus have been redesigned to be easier to use. WCCF IC 11-12 card uses the Aime card. 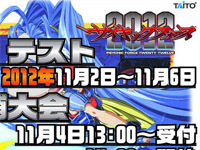 Taito just announced the future release of Psychic Force 2012 for NESiCAxLive. Psychic Force 2012 is a 3D fighting game out in arcades in 1998. 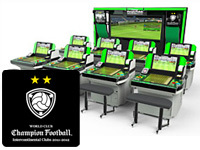 A location test will be held from tomorrow until November 6th at Taito Station Shinjuku. Mobile Suit Gundam - Senjo no Kizuna new update is out today. The two new mechas added are both coming from the OAV series Mobile Suit Gundam: The 08th MS Team released between 1996 and 1999. 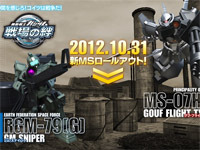 The first is the RGM-79[G] GM Sniper from the Earth Federation and equipped with a long-range beam rifle and a beam saber. The second one is the MS-07H-8 Gouf Flight Type from the Principality of Zeon and equipped woth a 3-barrel 35mm machine gun, a gatling shield and a heat sword. 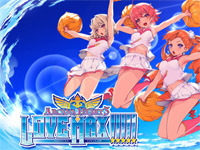 Today, EXAMU has announced the release of an Arcana Heart 3's update on NESiCAxLive this winter. Based on the console version, Arcana Heart 3 LOVE MAX will support a 16:9 ratio even the game is still in 4:3 ratio, two bands giving information on characters will be added on each side as in The Rumble Fish 2 for NESiCAxLive. A traning mode will be available. Other changes will be done as new moves for each character.